ShixxNOTE 6.net can send note to other computer in your LAN which doesn't have installed program, that receipient will receive simple message box with note text. 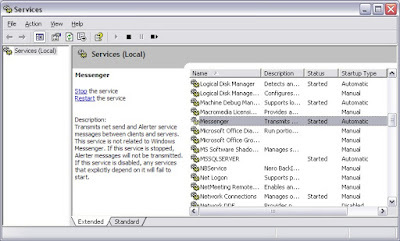 Program is using NET SEND command and Messenger Service. Windows XP operating systems have this service. Before SP2 service was started automatically, but after release of SP2 for Windows XP this service has been stopped by default. So when ShixxNOTE 6.net is sending (trying to send) note via NET SEND and recipient doesn't have Messenger Service started he will not receive note text in simple message box. That is why you should have Messenger Service running for NET SEND to successfully send a message. You can start or stop Messenger Service at any time. And you can also configure it in such a way that it would start automatically at the system startup. There is a special program for controlling all services in the system - Services. See below the guide on how to launch Messenger Service and configure it to be launched automatically. To receive messages in Windows 95/98/Me you can use Microsoft Winpopup to receive and send messages. The program is included in the standard distributive package, but you could have failed to install it when you were installing the system. Open Add/Remove Programs from Control Panel. In ShixxNOTE 6.net recipient list you can insert computer name or IP address of recipient who doesn't have installed ShixxNOTE program. In this case program will use NET SEND command and will send note text to recipient via Messenger Service. Off course if recipient doesn't have Messenger Service started he will not receive nothing and ShixxNOTE will inform sender that note was not delivered. Everybody is talking about Windows Vista and how will old programs work on new Microsoft Windows platform. So I decided to check if ShixxNOTE 6.net is ready for Windows Vista. I have installed Windows Vista Ultimate version on one new computer in my LAN. Everything was prepared for installation of ShixxNOTE 6.net latest release (December 2006). After running setup file, I got security message if I trust publisher (simple click on yes). Then second question from Windows Firewall asking you to choose „Block“ or „Unblock“ ShixxNOTE program, you must click on „Unblock“ button because network functions, sending and receiving notes will not work properly if you click otherwise (read more about this topic in previous articles). And that was all, installation was completed and ShixxNOTE 6.net was ready for use. I must say that I was very excited with new look and style of all program dialogs and menus. Dialogs and menus really looks great on Vista. Here you can see some screenshots. Sending and receiving notes works without any problem. I have tested sending and receiving notes, between computer running ShixxNOTE 6.net on Windows XP and this new one running program on Windows Vista Ultimate and everything works perfect. Reading network neighborhood and all other network features works normal. So if you have bought Windows Vista you can freely install ShixxNOTE 6.net program on your computer. Program is 100% „Windows Vista ready“ and you can be sure it will work. So at the end I must say that I am proud, because ShixxNOTE 6.net (developed in Visual C++ 6.0) works on every Windows operating system from Windows 95 to newest one Windows Vista. And you can send and receive note(s) without worrying which Windows operating system is installed on other computers in your LAN. I have just released new program major release. ShixxNOTE 6.net (Released December 2006) Build 125. This new version is now available on program homepage site under Download section. Critical security bug is now fixed. Parsing network message is improved and now possible attacker can not cause buffer overflow. This bug was discovered by Luigi Auremma. Important bug fixed. All received notes will be visible after computer or program restart. Problem with disappearance of received notes is now fixed. In previous version, received notes sometimes were lost after program restart. Now in this new release you will always see all your received notes and no more lost notes. Luigi Auremma discoverer of security bug was informed and he changed his ShixxNOTE program change log file with new update that bug is fixed and that new release is now available on his site. Check now ShixxNOTE program info on his official security site. Also I have to inform you that ShixxNOTE 6.net is ready for Windows Vista, check program homepage under section What's New or Awards to see more.